Public Speaking Gigs: Shooting Fish In A Barrel! Before you read this public speaking article and how to get public speaking gigs, read this article on fear of speaking if this is a road block for you (it is for millions of others, so you are not alone). If you want to get an avalanche of hot leads knocking down your door you need to get in front of a group of interested prospects. And the fastest way to do that is to do free speaking gigs at various associations, chamber events, churches, and entrepreneur clubs. The fist place to start your public speaking prospecting is the Chamber Of Commerce. 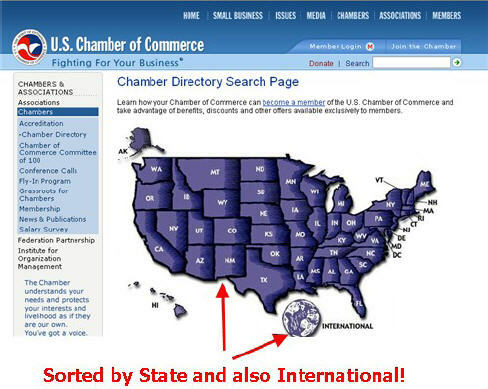 Go to their main site to find the local Chamber addresses and phone numbers. Call them and ask to speak to the person in charge of booking speakers. If you get a gate keeper tell them that you are interested in speaking because you have a hot topic that will help their Chamber members. Tell this person that you can speak on a variety of topics that will help their Chamber members in the area of tax planning, benefits, etc. And what topics he or she thinks they would be most interested in. You might want to tie your speech into what is happening in the news: distrust of big banks and big business, and politicians. Health insurance. Medicare. The new tax law changes, etc. etc. This way you are 'top of mind'. But if you say, 'I am a financial planner', you are now the bottom of the barrel. Instead say something like, 'I am a financial planner that specializes in helping business owners reduce taxes and financial expenses, and retain employees'. Or, 'I am a financial advisor with a specialization in keeping aging parents out of the nursing homes, and staying at home'. Or something like that. Go to www.MeetUp.com and Click on the FIND a Meetup Group. Type in 'business owners', 'entrepreneurs', even niche business owners for niche marketing. Also, sort by zip code or distance. Tweak the action plan for approaching Chambers above. This is just two ways to find groups that want to hear speakers. Offer to do webinars and teleseminars. Go after website owners and tailor a seminar or webinar, as well as a plan just for them. Do this for other niches as well. Send Thank You Cards To Everyone You Speak With Even If They Reject You. Include Something Memorable. Don't let the fear of public speaking keep you from making real money. Because it really is a one way ticket to bigger pay days and commissions...Get the Get Applause Now Course. I highly recommend it!